Marianne Huijsmans says she was fortunate to join a department that recognises the importance of collaboration with Indigenous communities. Her work explored a Central Salish language and its syntax. We bring together students and faculty members across three distinct but overlapping areas of specialization: linguistic theory, applied linguistics and Indigenous language revitalization. Our faculty and graduate students undertake research on a wide variety of topics—from the needs of minority language communities and the social aspects of language variation, to language acquisition and linguistic theory. 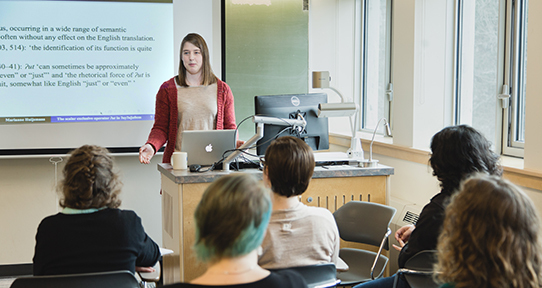 The UVic Department of Linguistics is a leader in Indigenous language study and revitalization, working closely with local communities and with the Faculty of Education.